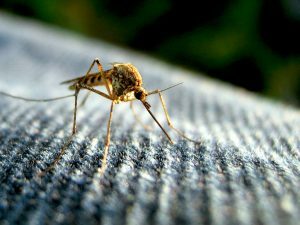 “Powerful” is a word used loosely by many electric insect killer manufacturers, so I recognized the need to compile a list of truly robust models that fry mosquitoes to high heaven. To make the grade all zappers needed have a big, bad electric grid at its core, coverage of at least one-acre outdoors, and preferably utilize multiple 40-watts UV lamps. Order reflects the level of brawn: best stuff at the top. So let’s take a look at the fairly small pool of high-wattage heavy-weights available today. Covering a whopping 2 acres outdoors or 2,000 sq. ft. indoors, the FC-8800 Diplomat is Flowtron’s flagship. And that’s saying something as Flowtron makes more high-coverage, powerful models than anyone else. It’s also a beast in terms of size, measuring 12 x 12 x 27 inches; that’s over 10 inches taller than their other powerhouse, the BK-80D. 120 watts of UV muscle is provided by three 40-watts bulbs. Although the Diplomat will kill any flying pests including mosquitoes, its specially designed to lure flies with its reflector panels and replenishable pheromone lure. If it’s mainly mosquitoes you want to crack down on, the BK-80D provides top-end specs at a really fair price. It covers 1 ½ acres compared to the 2 acres of the FC-8800 above yet sells for one-quarter as much. The top of the case resembles a pitched roof which is a nice touch as this is a classic hanging design that must be mounted on a security pole in an uncovered area. Two U-shaped 40-watt black lights attract flying pests and included Octenol mosquito attractant adds to the effectiveness. This space-aged offering from Stinger has the same coverage specs as the BK-80D at 1 ½ acre. However, it’s a little weaker in the UV lamp category with one 50-watt bulb rather than two 40-watters. To make up for that the killer feature here is the smart sundown sensor which turns the unit off at dawn and on at dusk. The “3-in-1 kill system” marketing jabber is a little overblown as a UV light, octenol lure capability, and clog-free grid are pretty much standard features. While not as amazing as the zappers that came before it on this list, the BZ-40 looks decent on paper. 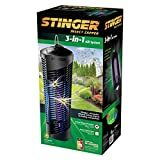 It features 5,500 volts of power compared to 5,500 watts in the Stinger 3-in-1. UV lamp power is the weakest of any we’ve look at, with just one 40-watt bulb. BZ-40 has a regular and deluxe edition with one key difference: the deluxe model has a sensor that turns the unit on at nightfall and off when the sun comes up; the same feature that is built into the Stinger 3-in-1 standard. It’s last here due to bug control performance that lags behind Flowtron and Stinger products. Complaints about reliability are also stacking up, so while Black Flag’s offering will work in a pinch it shouldn’t be your first choice. Flowtron is known for their large, powerful bug zappers that cover a larger area than the competition. The BK-15D is their most affordable, humble offering for people that need to protect a half an acre from pests, not engage a mosquito armageddon to benefit neighbors. By comparison the BK-40D and BK-80D are a little larger and cover 1 acre and 1 ½ acre respectively. It’s made with the same high build quality as its larger siblings. Top of the steel exterior acts like the pitched roof of a home: rain water safely drips down the edges far from the electrical grid and UV lamp inside. 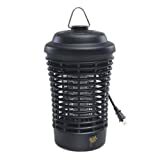 The 15-watt black light bulb attracts mosquitos, flies, gnats and other flying pests. Octenol attractant can be used to pull in mosquitos more effectively. 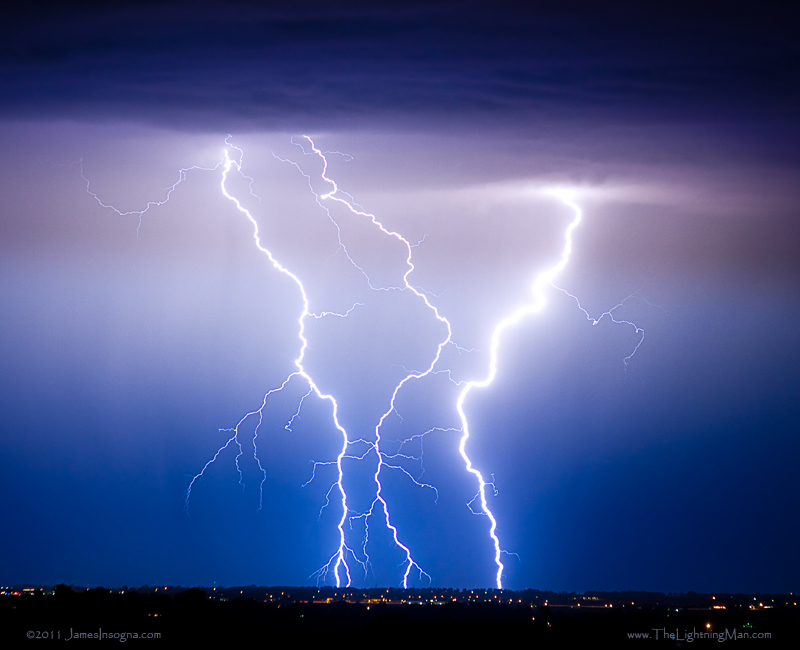 Adding lure turns a device that only needs electricity to operate into a zapper that may cost an estimated $2.50 to $5 per month depending on the climate. Hot weather means the attractant doesn’t last as long. But keep in mind, the BK-15D may serve you fine without lure. Along with the bulb, the heart of a zapper is of course the electrical grid and these are designed not to clog. Bugs go where they should: the pan at the bottom. You’ll be cleaning this puppy often. The thoughtfulness of details in its design puts Flowtron in a league higher than most insect killer stuff you’ll see on Amazon.com. It must be hung 25 feet away from you and your guests. You see, it’s so adept at attracting mosquitos you don’t want to place yourself along their path. So chances are hanging it from your rooftop won’t be a good idea. Ideally, get a tall metal rod to mount it to, so you have full control of placement. Then you’ll need to run a long, landscaping extension cord to it. Flowtron is a recognized brand that’s been around for a long time; since 1920 to be exact. Another reason to go with Flowtron is the parts will be available for a very long time. This is another reason to be weary of competing Chinese products that all look suspiciously similar to each other, and are sold under various names. Not reassuring that when the UV lights goes, you’ll be able to find the right replacement when it’s a potentially fly-by-night operation. It’s hard to find fault with the excellent BK-15D. Flowtron makes rock-solid zappers. The only baffling item is the price; it often sells for nearly the same as the larger BK-40D model but covers half the radius. It’s a little stockier, smaller and cuter than other Flowtron models in this series so for people with a small yard this is the one to get regardless. Although any electric insect killer works inside the home, some models excel at it, and only a few are specifically designed for it. Since a good portion of bug zappers protect large outdoor areas from insects, these are overkill and will look cartoonishly large indoors. Smaller, less expensive zappers are a better fit. Indoor/outdoor bug zappers are a viable solution but it’s important to remember to remove any chemical lure before moving it inside. Some of the better bug zappers give you the option to use chemical lure such as octenol which gives off an odor and is potentially harmful as its intended for outdoor use only. Most compact bug zappers are chemical-free however. In a space where dubious brands are the norm, Flowtron is a family-owned business that has been around since 1920. 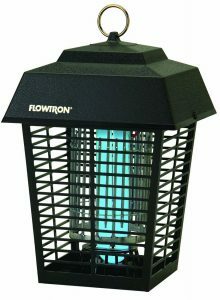 The BK-15D is Flowtron’s smallest, entry-level bug zapper and yet it still manages to cover 1/2 acre which is way beyond what most bug zappers can do at this price. If you want something you can use both inside the house and in the yard, this may be the only zapper you need. 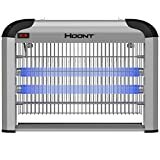 You’ll come across flat panel electric insect killers with a super-similar look marketed with the names of Hoont, Liba, Aspectek and PestZilla™. All are 20 watts, have two blue UV lights inside and cover 6,000 sq. ft. These sit against the wall and can also be set on the floor making it easier to find the right place for it that’s out of the way. Safe, and doesn’t use chemicals. If you aren’t put off by its funky green exterior and unusual appearance, this is one of the smallest indoor solutions that still packs a punch (coverage of 30 sq. meters / over 300 sq. ft.). 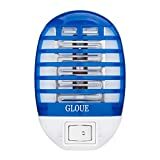 Like other zappers it uses a LED light to attract pests, and throws in an interesting twist with a suction fan that pulls in the prey, zapping it via the interior grid. To clean, lift the clear plastic shield and give the grid a quick wipe with a paper towel. Its elegant, tulip-like design and slimmer than average dimensions (7.1 x 7.1 x 13.4 in.) make this a good indoor unit. Operation is eco-friendly and chemical-free: the integrated UV light is enough to attract mosquitos, gnats, flies and other pests. Covers an area of 500+ sq. ft. which is fine for small indoor spaces, but it’s outside applications are limited to protecting just a deck or gathering area. So you need a nightlight and an indoor insect zapper. Why not kill two bugs with one light? This is the only product listed here that is feasible for travel. Equally good in hotels, motorhomes, and campers. The blue case fits over a compact electric grid and at the very back there is a strip of tiny LED lights to attract gnats, flies and mosquitoes. Great that the cord is eliminated plus you don’t need to find a way to mount it. There’s something diabolically satisfying about silencing an annoying fly with a fly swatter. The Zap It! takes that idea, makes it possible outdoors, then brings it to the next level. Plus, it adds high-tech features such as USB charging, bright LED light and safety mesh to boot! While practical in function the Zap It! can practically be considered a toy for adults. Who could possibly resist an electrified tennis racket with a cool lightning bolt symbol at the center of the mesh? The sheer novelty of it will inspire curiosity in your friends who will want to give it a swing for themselves. The unit is powered by a battery which provides 2,000-volts to the grid. This will instantly kill flies, mosquitoes and other flying insects. It can be charged via a micro USB port located at the bottom of the handle (under a small yellow cover). This is a welcome feature in an era where phone chargers and so ubiquitous and USB ports are found in practically any laptop. 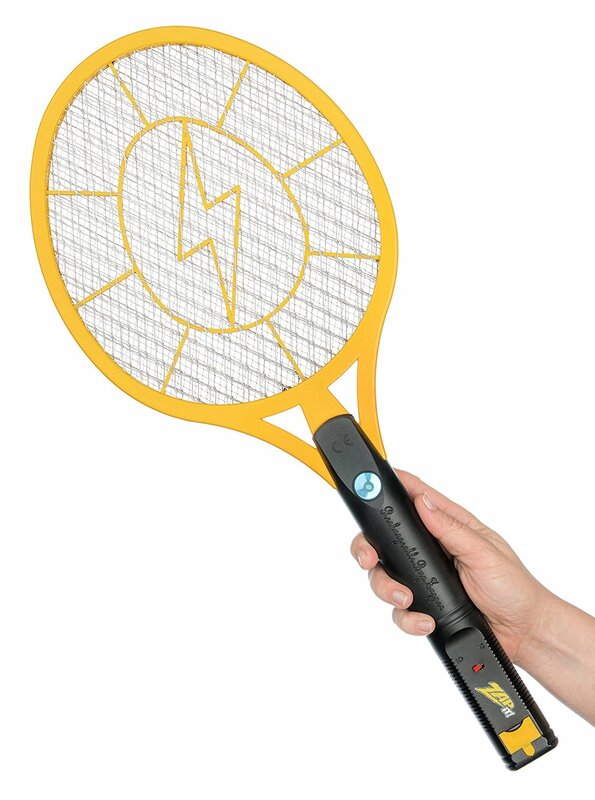 Now you may be wondering how difficult it is to start zapping bugs in a large backyard. This is where the LED light comes in. 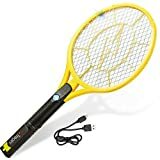 The super bright LED attracts the bugs to just about the right general area and all you need to do is apply some skill to that backhand. It should be noted the Zap It! handheld zapper is also useful indoors. In case your drunk uncle tries to electrify your backyard barbecue guests the racket has a triple layer safety mesh that will protect them from harm. It’s only bugs that need to be afraid of this thing. This is a rigid swatter so the price of the technology is that you won’t want to risk cracking it by slamming it against walls and other hard surfaces. Still, this adds to the fun as it requires a different swatting technique compared to floppy classic fly swatters. If hunting down pesky flies and mosquitoes sounds like fun stop reading and order this thing today. With a street price of around $20, you can’t go wrong. However, keep in mind you’ll want to have either citronella torches or a traditional bug zapper too if you plan to stay outside for hours. As fun as it is you won’t want to be the official bug killer guy or gal for too long, and neither will your guests after the “hey, what’s that?” factor wears off. 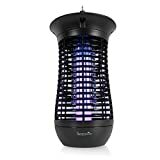 Maybe your bug zapper needs aren’t that demanding, or perhaps running a power cable to the right spot on your deck to an insect control device isn’t feasible. Everybody wants to cut the cord for the sake of convenience, but only certain people should. 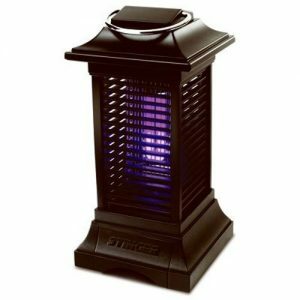 For people that enjoy hosting backyard gatherings often, a bug zapper that protects the entire yard is a must. Many of us don’t need that and can improvise with Citronella torches when special occasions arise. If it’s that one spot you spend the most time at that matters, your deck or stone patio, for this purpose the Stinger by Kaz is ideal. The Stinger covers 625 sq. ft., which is approximately 25×25 ft. It’s a modest specification, but if it’s all you need and the idea of battery power appeals to you, it might be worth the tradeoff. On full charge it runs 3.5 hours. This also limits its applications. It will protect you and company while sitting outside for an after-work brew, but you’ll want another product for an outdoor blast. The unit charges and operates while plugged-in. In a pinch you won’t be out of luck if you run out of battery power as long as electrical outlet is nearby. Recharging time is three hours. The status light is red while charging and it switches to red when it’s ready. There’s a switch with two settings: UV killing grid and lantern mode. When lantern mode is engaged two white LEDs light up. It’s more of a decorative light rather than the bright illumination you’d expect from a lantern. This is a unique feature that adds to its utility, and makes it even more attractive to campers. To attract pests it uses NOsquito Mosquito Octenol Lure. It contains octenol to pull in and kill mosquitos and other annoying insects. Attractant is slowly released over the course of 30 days. So you’ll be replacing these each month at $7.50 a pop, which is a pretty standard cost for operation comparable with Flowtron and others. Cleanup is a little trickier than you’d expect. If a bug hits the metal interior it will stick to that rather than drop down to the removable tray. It’s not a deal breaker, but it may be a good idea to dismantle it every blue moon to clean the unit thoroughly. The Stinger is perfect for small gatherings and particularly campers who will appreciate its rechargeable capabilities and lantern mode. The unit only covers 625 sq. ft., which is just enough to protect an average deck or patio. Its strengths may be most apparent to those who have a larger unit and can use both units together or just one depending on what is needed that evening. Copyright © 2019 Best Insect Killer. Powered by WordPress and Themelia.